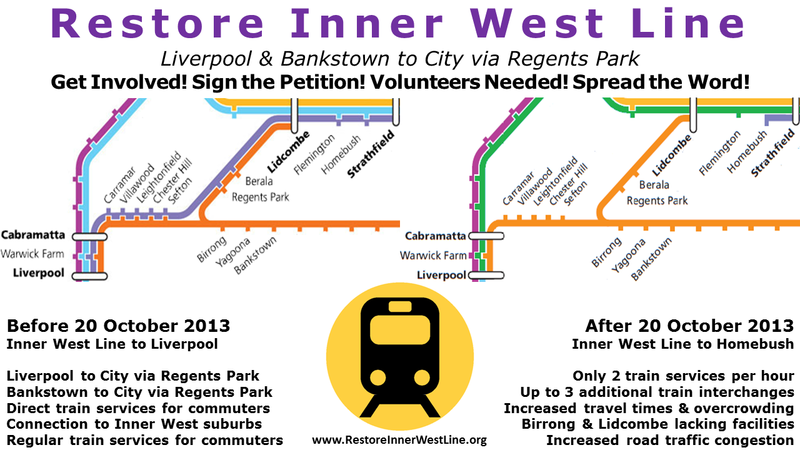 The Restore Inner West Line campaign was started in October 2013 as a response to the NSW State Government's timetable changes for Sydney Trains implemented on 20 October 2013. The timetable changes terminated the Inner West Line at Homebush thus removing regular Liverpool & Bankstown to City via Regents Park services. Information about the Restore Inner West Line campaign founder is available on our website. Building on this is a Community Action Group started in December 2013, comprising of local residents, community representatives and supported by Barbara Perry (MP for Auburn), the community action group seeks to lobby the State Government for the restoration of the Inner West Line on the Sydney Trains network. This campaign and community action group is independently financed by the founder at the moment. Restore Inner West Line is not an official association of any political group or a corporate entity. It has come to our attention that a small number of people have presented criticisms of the Restore Inner West Line campaign. We will respond to all comments about Our Objectives in a respectful manner and equally expect the same from others in the community. Comment: Restore Inner West Line is a just a small number of complaints from Berala and Regents Park. Comment: Commuters from Berala and Regents Park would have changed for an express train at Lidcombe. RIWL Response: The Inner West Line before October 20, 2013 was an all stations service between Liverpool and the City via Regents Park (as well as Bankstown to City via Regents Park). Many commuters do not travel into the city instead travel to suburbs in the Inner West such as Homebush and Newtown. Many of commuters relied on the Inner West Line to travel from South West Sydney to the Inner West without the need to make interchanges (at Birrong, Lidcombe and Strathfield). RIWL Response: Express services are often also more congested, for commuters travelling from Sydney's South West (Berala, Regents Park, Sefton, Chester Hill, Leightonfield, Vilawood, Carramar), many have now reported that congestion and overcrowding at Lidcombe station for City bound services has significantly increased. If the Inner West Line had been retained, congestion at Lidcombe would be lowered thus indicating that not all commuters (even city bound) would have necessarily changed for an express. Observations by local commuters have reported in the past that passenger numbers did not vary highly between Berala and Flemington on former Inner West Line services. Comment: The improvement's the Bankstown Line are adequate (and compensate for the removal of the Inner West Line). RIWL Response: The state government has given the false impression that the entire Bankstown Line has received service improvements. Stations such as Berala, Regents Park, Sefton, Chester Hill, Leightonfield, Vilawood, Carramar have had a reduction in over 80% of train services. These 7 stations used to part of the Inner West Line timetable booklet in the Liverpool to City Circle via Regents Park section. A closer inspection at the back page of the current Bankstown Line timetable shows that there are only 2 "special" Liverpool to City Circle via Regents Park and 1 "special" City Circle to Liverpool via Regents Park service each weekday. Over 98% of Inner West Line train services have been cut for stations between Homebush/Lidcombe and Liverpool via Regents Park. Since October 20, 2013 there have also only been 2 train services (every 30mins) for Berala, Regents Park, Sefton, Chester Hill, Leightonfield, Vilawood, Carramar per hour for most of the day. down from 3-4 services per hour - every 20mins approx). We will be posting more responses and information about Restore Inner West Line on our website shortly. Please subscribe via email for updates.